Item Size: H-3", L-4.5', W-4.5"
Our association is amongst the remarkable manufacturer and exporter of Ice Tongs. These Ice Tongs are extremely convenient and simple to use that offer impeccable grasping utility. Our Ice Tongs are lightweight, durable and have a brilliant arrangement for holding ice. Shop with confidence this Handmade Brass Ice tong. Handicrafted by Expert Artisans to serve the Brass loving people. 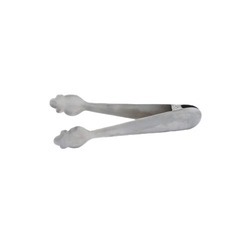 We are instrumental in providing a vast range of Stainless Steel Tongs (Item Code: TNG-501). Our exclusive range has won the acclamation of several reputed clients. Entire range includes salad, spring, oval, royal, and deluxe tongs. These are extensively used in the commercial as well as residential kitchens. With sincerity and hard work of our professionals, we have carved a niche for ourselves in this domain by providing a premium quality gamut of Brass Ice Tongs. To optimize the activities of our clients, we manufacture a huge collection of ice tongs which are very easy to grip. These are used in the luxuries parties and diners. Our range is known for their cost-effectiveness and longer service life. We are presenting a wide range of tongs in different shapes & sizes in order to meet the varied requirements of our clients. These tongs are specially designed for kitchen and dining use and provide good and comfortable grip. 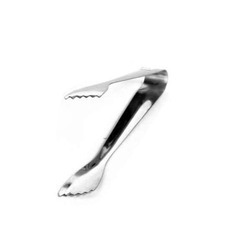 This piece of tong is ideal for lifting and serving Ice. The handles of the tongs are ergonomically designed with a shallow channel for a comfortable and secure grip.